The sign is installed, and the blueprints are in the works. We received our APPROVED blueprints from the city of Austin. Construction will begin immediately. Projected opening date will be late October/early November. Our #DoughNation non-profit for Monday Jan 25 is Southlake Carroll High School Junior World Affairs Council! Mention CHS with your order at any i Fratelli that day and they’ll receive 15% back for their program! 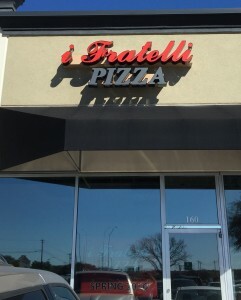 i Fratelli Pizza Austin is coming soon to 10001 Research Blvd in the Arboretum area. Our Arboretum store will be followed closely by Downtown and Westlake locations.